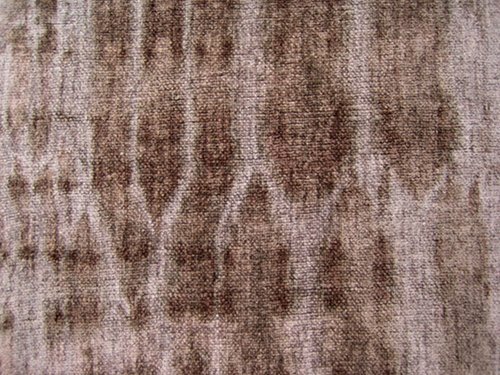 Silk chenille – woven, dyed, discharged. This was hard to photograph because of the way it responds to the light. An intriguing cloth, and I’ll need to think a while about where to take it next. Weaving: Silk chenille for warp and weft, sett 15 ends per inch. Monks belt threading on 4 shafts. 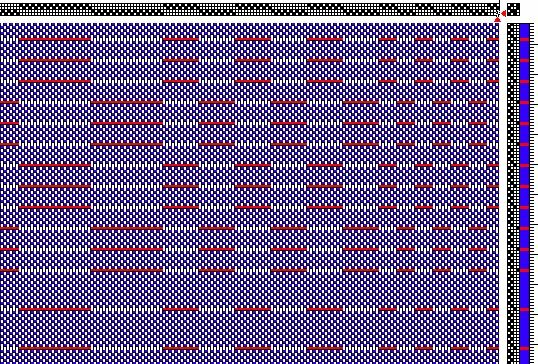 The warp has block sizes of 6, 12 and 24 ends. 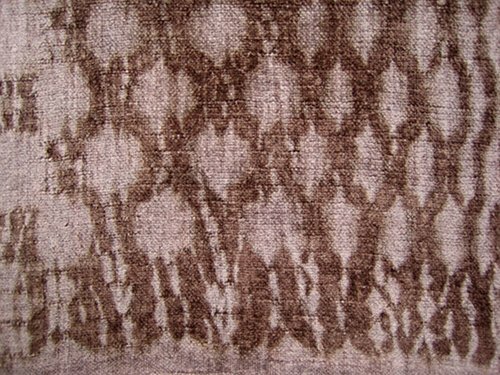 The chenille was woven in plain weave (blue weft in the draft). 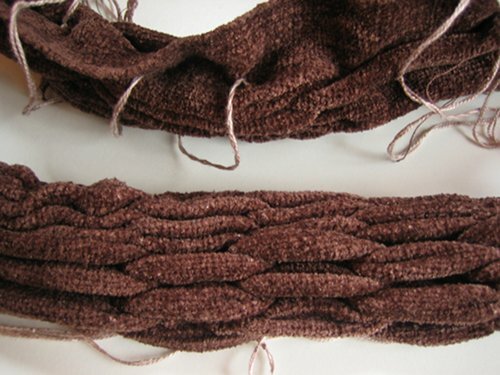 I wove floats in the monks belt pattern using a strong cotton thread as weft (red in the draft). 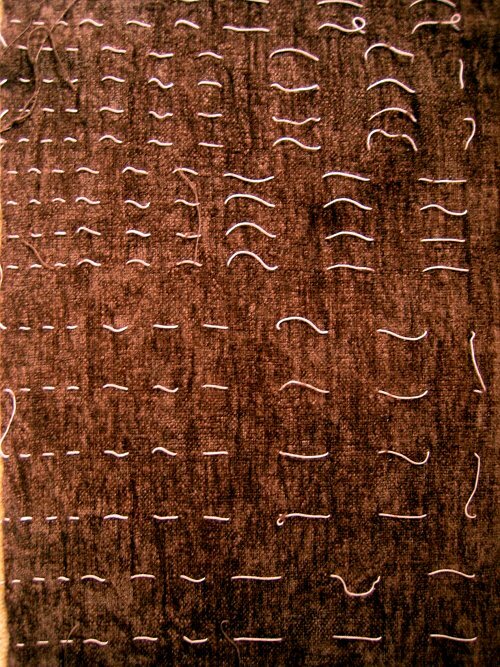 I experimented with 6, 12 and 24 picks of chenille between each pick of cotton. For the second half of the sampler I only lifted one pattern shaft with the cotton, giving a mix of plain weave and floats. Dyeing: Immersion dyed with Lanaset dyes, which dye protein but not cellulose fibres. This photo shows the varied spacing and the monks belt blocks of the cotton weft. 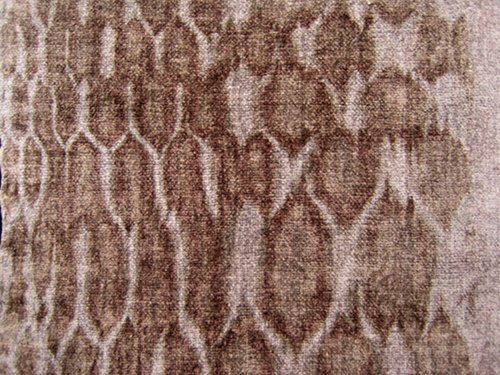 The chenille was a rich chocolate brown and not as uneven as it appears in the photo – the cloth hadn’t been pressed after dyeing, and the light caught the texture. Simply adding colour made the cloth much more attractive than my earlier samples. Gathering the cloth: The cotton wefts were used to gather the cloth into pleats. I pulled and knotted pairs of wefts, trying to make the gathering as tight as possible. The idea is that the next stage of the process mainly impacts on the exposed cloth, with the interior of the pleats protected from change. Finishing: Each end of the cloth had 20 picks of 20/2 silk. Straight off the loom I oversewed by machine using a three stitch zigzag (it takes 3 stitches to the left, then 3 to the right) using a silk sewing thread. I went over each end 3 times. The dye and discharge worked on all the different silks. After discharging I handwashed, used fabric softener in the final rinse, and air dryed flat. I used a folded blanket to pad the ironing board surface, and pressed both sides. Although the result is big enough for a scarf I see it as a sampler and have simply cut the ends short at the machine stitching line, to see how it wears. A few views of the results. There are areas of greater and lesser definition in the patterning. Where the gathers were widely spaced the discharge solution was able to penetrate more, more colour was removed and the effect is much softer. There was more difference on the two sides of the cloth than I expected. I did long overlaps of the yarn ends when changing bobbins. There’s no sign of worming, but there is a visible difference following the dyeing and discharge which I think no-one else would see. Still, I’ll try tieing the core-yarns next time. Su Butler’s book-on-CD Understanding Rayon Chenille arrived today – a Sunday, from California to Sydney just 8 days from order to delivery, so impressive work by Village Spinning & Weaving and the US and Australian postal services! I’m looking forward to reading that while I ponder what to do next. I like what I’m getting so far, but I don’t feel I’m getting the best from this yarn yet. It’s only because I have some need to be “complete” that I’m even going here. Attempting monk’s belt was when I found out that weaving isn’t always a pleasure. It’s not the structure or the look (it looks very old-fashioned and limited and fusty to me, but that’s probably my inexperience and lack of imagination). No, it was The Loom. Not my loom, mind you. Up to this point everything had been woven on my nice second hand Robinson 4 shaft 24 inch wide table loom, purchased from a lovely lady who learnt weaving for a year back in 1982 or so then carefully stored it on top of a cupboard. (pause for breath after that runaway). My loom, always well behaved, was still occupied with the autumn twill when class restarted, so I hired it’s little sister from the guild – a narrower and (I suspect) younger Robinson 4 shaft. Had it had a hard life? Did I get something backwards while dressing it? Was it just the standard perversity of the inanimate? I could not get good tension. Every time I tried to tighten enough for a semi-decent shed, pawl and ratchet lost connection. I fiddled, Liz fiddled, other class members fiddled. We tightened screws, added washers, tinkered with everything we could find to tinker with. I persevered for a few miserable centimetres then cut off the warp, put the sample in its plastic sleeve with the class notes, and buried it.